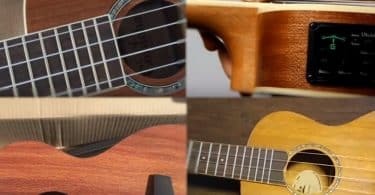 Best Baritone Ukulele Review: 5 Top-Rated in April 2019! What Are The Best Baritone Ukuleles? Ukuleles are lute family instruments and come in a number of configurations including four nylon or gut strings or four courses of strings. Some ukulele string configurations may be paired in courses, giving the instrument a total of six or eight strings. 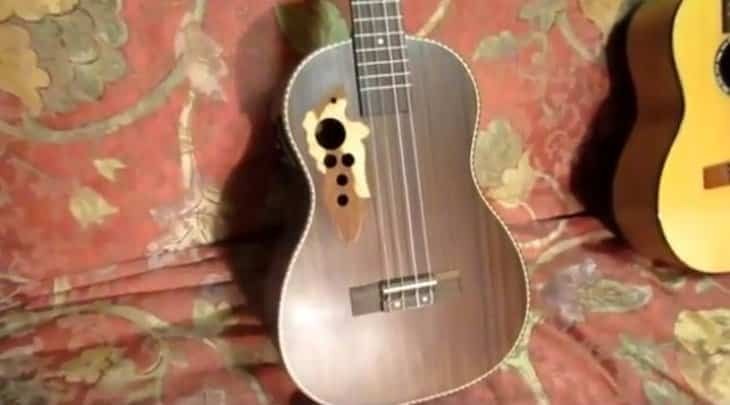 Ukulele’s originated in Hawaii after Portuguese immigrants from Madeira and Azores brought the Portuguese Machete, which is a small lute instrument that is similar to a small guitar in structure. From Hawaii to the US, the Ukulele became a popular instrument at the dawn of the 20th century, and its popularity only increased over time. There are four types of Ukulele; these include soprano, concert, tenor, and baritone. 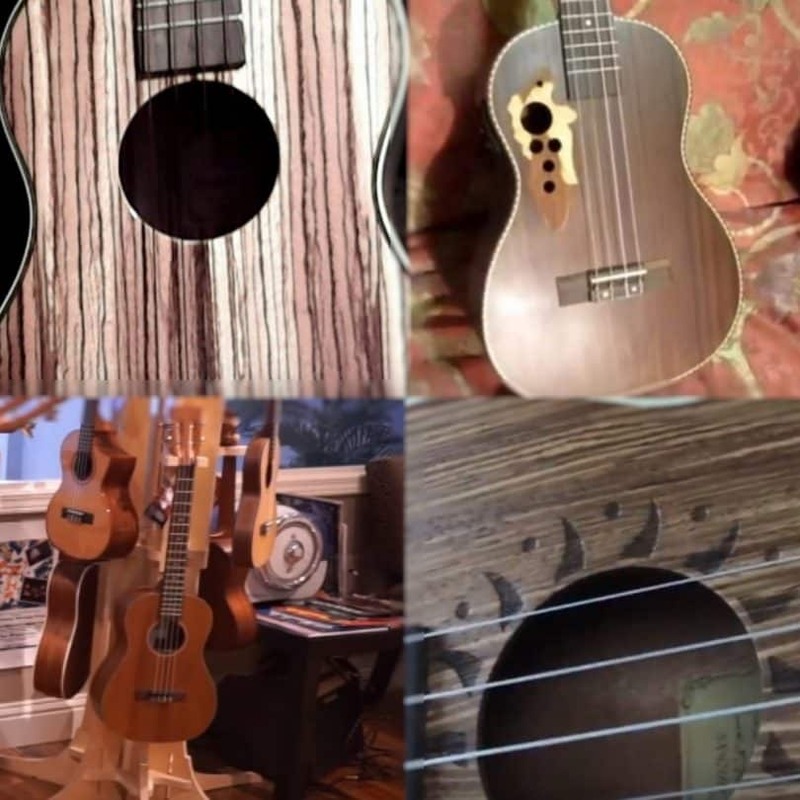 The most commons is the concert and soprano, while the baritone is making a comeback, the Baritone Ukulele is, in fact, the largest of the lot, and that’s why there were not as liked before since most users preferred either a smaller Uke or a guitar. Now let’s take a look at the five best baritone ukuleles on the market today. How To Pick A Baritone Ukulele? 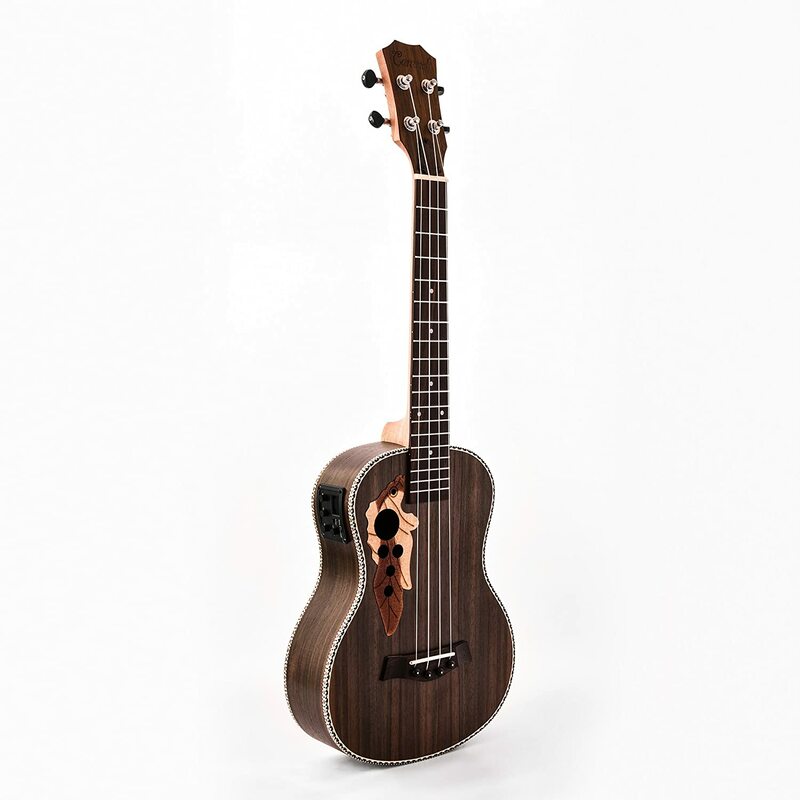 Kala is a world leader in ukulele instrumentation, and among its line of perfect instruments is the impressive MK-B. 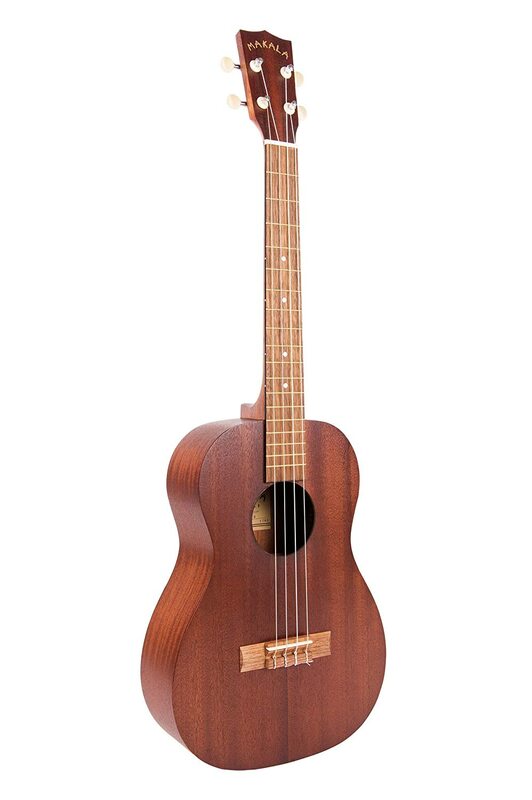 The Kala MK-B is a great Baritone sized ukulele for beginning enthusiasts. 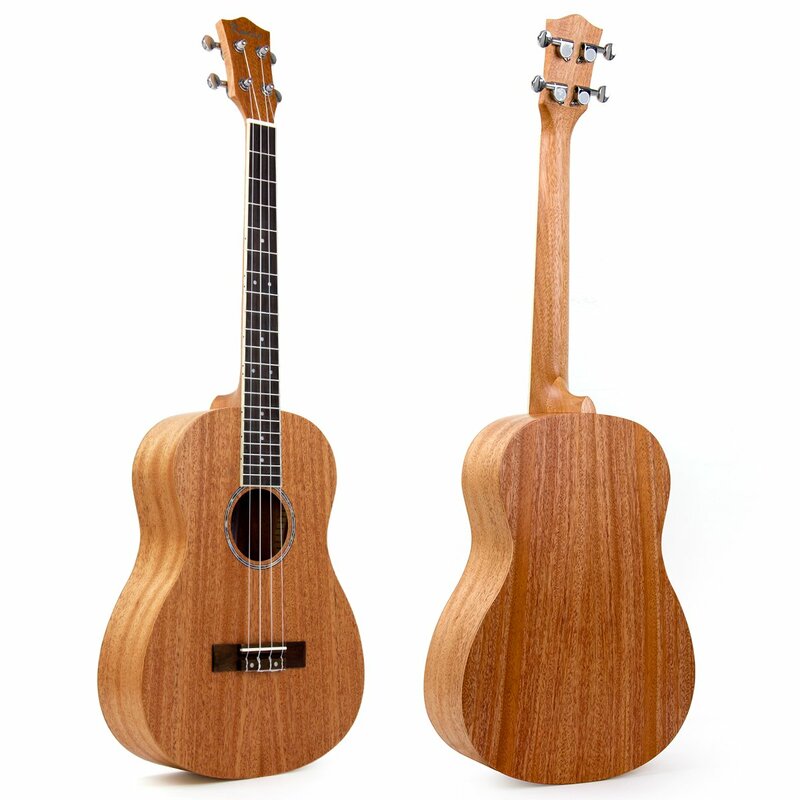 The mahogany wood gives you a nice classic look of a high-level ukulele and delivers good sounds. The Makala Classic line by Kala is basically the best entry-level ukulele set on the market and comes with a mahogany neck, a walnut fingerboard, brass frets and plastic saddle and nuts with Aquila Super Nylgut® strings and a standard headstock. The MK-B provides you with a traditional looking ukulele and uses tuning for the highest 4 guitar strings – D G B E – this makes the MK-B the best transfer instrument for guitarists and as such, classic addition to any guitar player that wants a uke too. The MK-B dimensions are a 30 ½” overall instrument length with a 20 ¼” scale length and a 14” body length. The waist is 6.625,” and the fingerboard width at the nut is 1 ½”. This is the best starter baritone Ukulele on the market for the price-performance ratio and is why I opened up with this model. When it comes to all-around models, then the Kmise Mahogany Baritone Ukulele with its 30” length is perhaps the one that all aspire to copy. This model comes with a 20 1/8″ scale length, and is perfect in dimension ratios, fitting all users with a precision designed performance instrument. The Kmise 30” baritone ukulele is a 4 string G-C-E-A model and has a lot of resonance with sustain. The bone nut and saddle are designed to provide perfect vibration harmonics and makes it easy to deliver a full sound range. The neat fret wire with smooth rosewood fingerboard makes this an easy playing model that eliminates scratching, and the lower action of this model is easy to press and eliminates buzzing. Obviously, all this is reachable since the strings are Italian made Aquila Super Nylgut®. This is a great professional model that is also designed for beginners and is made in China using European wire and natural wood. This is a great all-round model from a top Chinese manufacturer that is known for their high quality and low price ratio. This is the Caramel CB103 30 Inch High Gloss Zebra Wood Baritone Acoustic-Electric Ukulele with the truss rod. The Caramel CB103 is an electronic Ukelele with unique design and perfect performance parameters. This model comes with a Zebrawood body that is mirror polished by hand, a walnut wood fret and bridge and comes with a truss rod embedded in the neck that gives you neck adjustment capabilities. This is an electronic model and comes with a 3 Band integrated equalizer. What stands out with this model is its budget-friendly price making it an affordable high class and well-designed Uke. If you are a detail nut, then this model might not provide you with the depth of sound you want, since it has a built-in equalizer, which means you are forgoing a completely analog device. 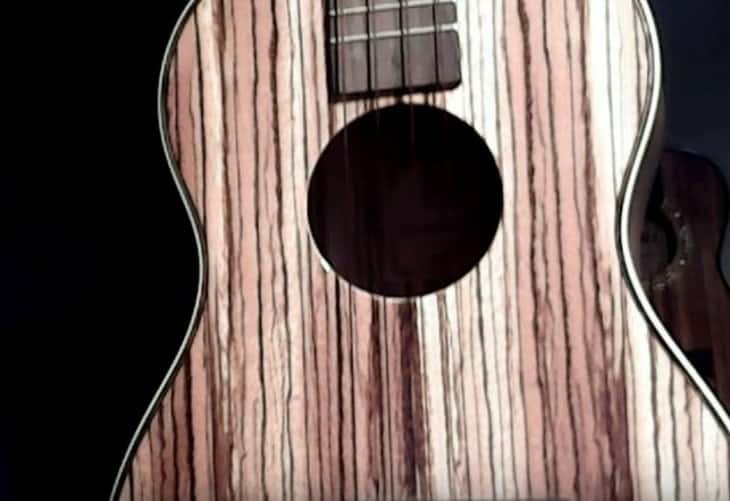 What you do get when you buy this model is a Baritone size 30” Zebrawood 18 fret ukulele that gives you easy to handle and great performance for an affordable price device. If you like electronic support performance, then this is the affordable uke you want to take. Price wise it’s hard to beat, and as a beginner model, its damned near to perfect. Occasionally you are confronted with a near-divine model of perfection or a near perfect model of divinity. In the electric Ukelele world, this means you just met the CB500. 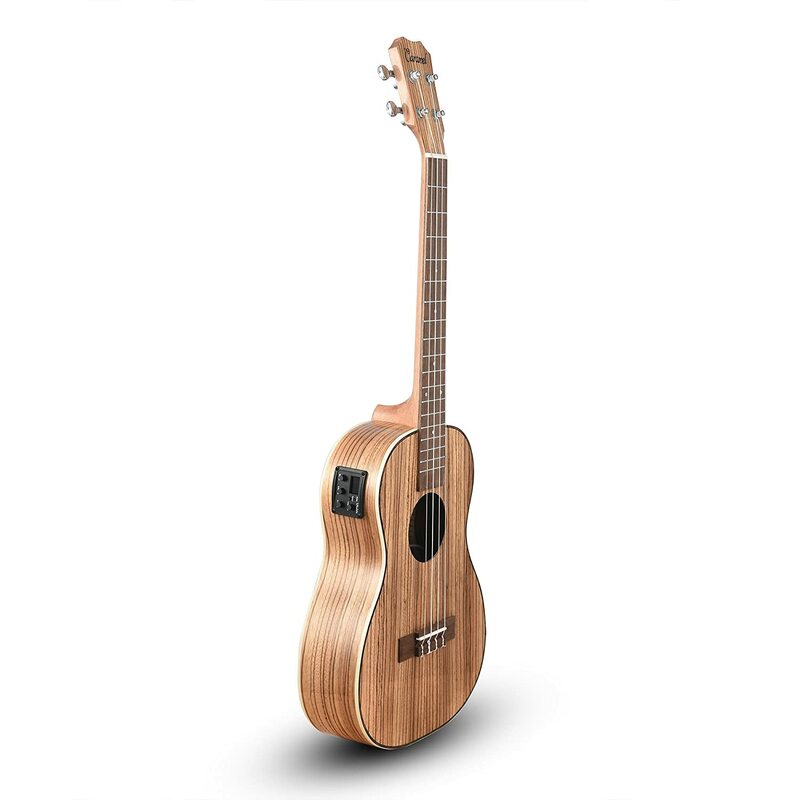 The CB500 is a 40” baritone uke that comes with outstanding performance and design features. Let’s start at the top and work our way down. This is a budget model that comes with a high-end style and finish. It came with a full sized 30” baritone body made from laminate rosewood and finished with a satin look and feel. The traditional sound hole is replaced with multiple sound holes on the side and upper bout. There is also a nice design feature, and the binding is added for extra style. The neck comes with an integrated truss, and the laminated rosewood fretboard has 18 frets in total, 14 in the clear and is easy to play with big or small hands. This is an electric model, so you get a built-in pickup and preamp. There is also a master volume control, 3-band EQ (bass, middle and treble), and a built-in digital tuner. In terms of sound, well for the price you pay it delivers a fully controlled range of rich high-end sound and acoustically delivers what the attuned ear wants to hear. This is an exceptional model, and for the value for money price you pay is their leading and most popular brand. 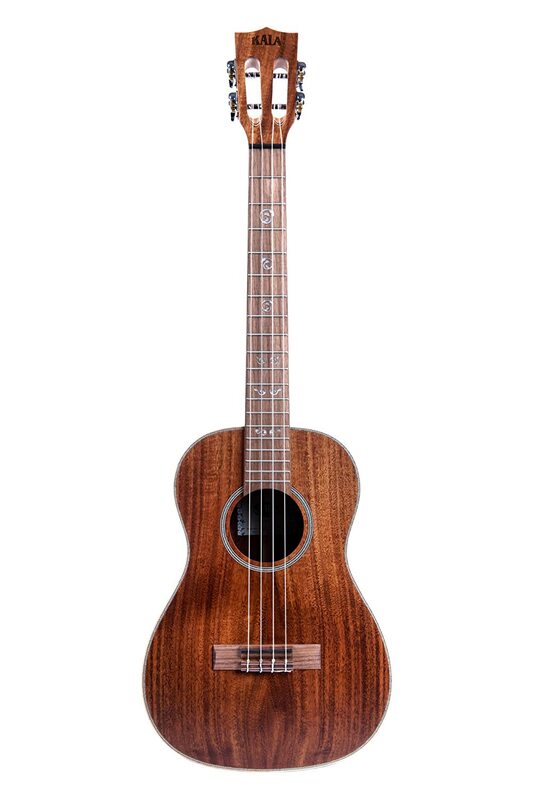 The KALA KA-SA-B New Solid Acacia Baritone Ukulele is a leading top rated brand model and is the most expensive Uke in this list. I saved it for last to present you with an exceptional model that delivers the best baritone performance, but is priced for professionals and not beginners. This model is made using Acacia wood and comes with solid wood, sweet tone, and unsurpassable attractive features. The wood binding and herringbone are finished with a satin look and feel and provide you with that classic concert look, this is a drop-dead beautiful model and would be the super-model if human. The new 2018 model comes with a lush sustain and deep, resonant sound and is tuned D-G-B-E, like the high four strings on a guitar. This is a great model for professional guitarists to invest in since they can simply transfer from one instrument to the other. The dimensions of this model are a 20 ¼” baritone scale with an overall length of 30 ¾” and a 6 3/8” waist. The nut width is 1 7/16,” and the arched body depth is ranged between 2 ¾” top 3 ¼”. This model comes with a maple binding with herringbone purling and has 18 silver-nickel frets. The Custom vine fret position markers are set at the 5th, 7th, 10th and 12th positions on the neck and at the top of the fingerboard. It doesn’t get better than this, except in price, and that’s only because this is a professional model for experienced players. A baritone (or bari) uke is tuned DGBE, exactly like the top four strings of a guitar, and a fourth down from the more common GCEA tuning. The bari uke is not tuned like a typical GCEA, it is tuned low to high, this means that the bari is a great instrument for guitarists to transfer over to, but for a standard uke player, it’s a problem to learn the new configuration. Budget-friendly models will come in laminated wood, while the higher end and professional models will be made from all wood construction. Laminated wood has an advantage over all natural wood in that it is stronger and less prone to the splitting and cracking. However, the all wood models a have a more resonant sound that delivers a richer and mellower tone. Koa is a native Hawaii wood and is dense. This was the traditional wood of choice for ukuleles. It is still considered the wood of choice and brings beautiful grain patterns, a wide range of colors, and balanced tone. Acacia is botanically related to Koa, delivers similar properties and is considered to be the alternative to Koa instruments. Mahogany is usually sued for the neck and is a growing global tree so much more popular in most models for price and design variations. Spruce has sprung up in recent times and is very popular with guitar makers. Spruce has a dense grain and produces loud, bright tones. Cedar is a soft wood and delivers a mellow tone; these are popular for tenor and baritone ukuleles. Redwood is very popular and is placed between spruce and cedar for tone, although it gives a warmer and clearer tone than both. Rosewood is mainly used in fretboards and is a dense, hardwood that adds color and design appeal. There are many more woods being used, but these are the main and most popular ones. 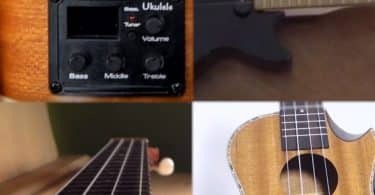 Just like all lute family instruments, you will find electric ukuleles too, and these come with a variety of electronic components integrated into their bodies. In most cases, these are uke’s come with an onboard preamplifier to an external amplifier or sound system. Which Concert Ukuleles Are The Best? Which Electric Ukuleles Are The Best? What Are The Best Tenor Ukuleles On The Market? Soprano Ukeleles – Buyer’s Guide! Which Acoustic Electric Ukuleles Should I Buy? What is The Best Ukulele Under $100 Bucks?